Andress, David, ed. – The Oxford Handbook of the French Revolution. Azzi, Stephen – Reconcilable Differences: A History of Canada–US Relations. Barber, Marilyn and Murray Watson – Invisible Immigrants: The English in Canada Since 1945. Bergère, Marc – Vichy au Canada: L’exil québécois de collaborateurs français. Bradley, Ben – British Columbia by the Road: Car Culture and the Making of a Modern Landscape. Denning, Andrew – Skiing into Modernity: A Cultural and Environmental History. Gaudreau, Guy, Sophie Blais et Kevin Auger – Mine, travail et société à Kirkland Lake. Hardy, René – Charivari et justice populaire au Québec. Hatton, Nathan – Thrashing Seasons: Sporting Culture in Manitoba and the Genesis of Prairie Wrestling. Klausen, Susanne M. – Abortion Under Apartheid: Nationalism, Sexuality, and Women’s Reproductive Rights in South Africa. Loewen, Royden. – Horse-and-Buggy Genius: Listening to Mennonites Contest the Modern World. 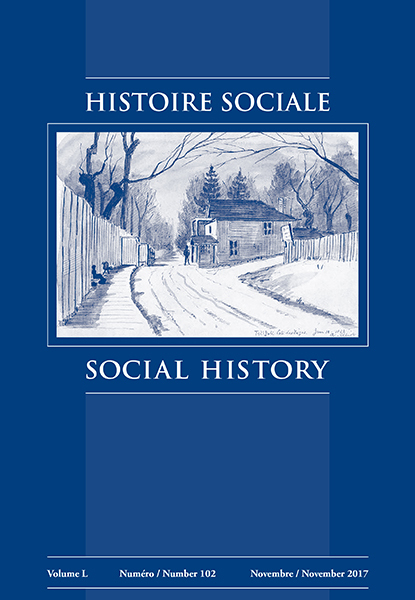 Muir, James – Law, Debt, and Merchant Power: The Civil Courts of Eighteenth-Century Halifax. Pelz, William A. – A People's History of Modern Europe. Pepin, Guilhem, Françoise Laine et Frédéric Boutoulle (dir.) – Routiers et mercenaires pendant la guerre de Cent ans. Rawat, Ramnarayan and K. Satyanarayana, eds. – Dalit Studies. Rotman, Youval – Insanity and Sanctity in Byzantium. The Ambiguity of Religious Experience. Rudin, Ronald – Kouchibouguac: Removal, Resistance, and Remembrance at a Canadian National Park. Thrush, Coll – Indigenous London: Native Travelers at the Heart of Empire. Wright, David – SickKids: The History of The Hospital for Sick Children.